I’m so excited to announce I’m teaming up with one of my favourite ever beauty brands today, Urban Decay, to offer you probably one of the best giveaways I’ve ever held! If you’re a beauty fan you’ll be aware of one of the most iconic makeup ranges of recent years – the Naked Palettes. Urban Decay’s Naked range has gone from strength to strength, and now includes base products, lip glosses and as well as a whole mass of palettes. 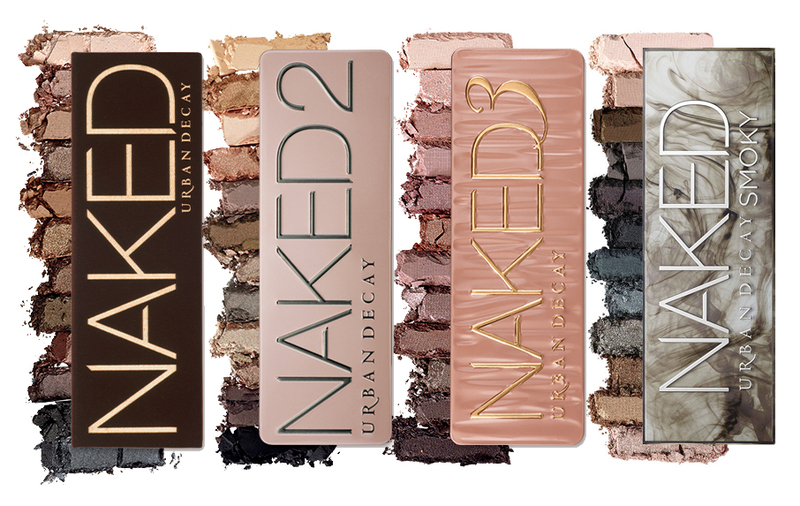 One lucky reader will win every single main Naked Palette that’s currently available. This includes the original Naked, Naked 2, Naked 3 and Naked Smoky palettes. These are worth £38 each, so that’s a prize bundle worth a massive £152! All you have to do is enter via the Rafflecopter widget below. The giveaway will run for four weeks and it’s open internationally. If you have any questions please feel free to get in touch. Prizes will be provided by Urban Decay. Next Post H&M X Balmain – The Collection Images You’ve Been Waiting For. I only have Naked2 but I love it! I’d love to win the others! Something for every Girl this Christmas !! I still don’t own any of the Naked palettes. Winning this would be a dream! This is crazy – definitely one of the best giveaways you’ve ever done! omg!thanks for the great opportunity!I don’t own any naked palette! hugs and good luck to all from Greece! Wow! I love urban decay palettes – my sister bought me my first one for Christmas last year! I just bought Naked2 yesterday and had the hardest time deciding which one to pick. I love them all! Winning this would be a dream come true, thanks for the chance ? What a great contest! These palettes are all so beautiful! I love Urban Decay brand makeup, makes my eyes look so funky on a nightout – it never fails! Fab giveaway, I only have a small UD naked palette so these would be a fab! Amazing giveaway , thanks for the chance …. You really can’t beat an UD palette! Thanks a lot for this great chance! What a super lovely giveaway, I would LA LA LOVE to win. I’ve never used this palette, but always wanted to use. If I could win this, I’ll be so happy because I always wanted to try! I have read many reviews on these palettes and they get great comments about them. Thanks for great giveaway. Fantastic Giveaway. Thank you for the chance. Adore these Palettes! Such a lovely giveaway! I have the Naked II palette and I love it! I’ve owned a few similar palettes by cheaper brands, though after reading reviews and blogs about Nakeds I’ve always wanted to own. If I had to make a choice my favourite would be Naked 3, however they all have lots of shades I love and are so very wearable. I’ve read so much about these palettes, would love to try so thanks for the giveaway! This would make my partner sooo happy for Christmas this year. Urban Decay Naked Palettes what a great competition. omg I don’t own any, this would be a DREAAAAAM! 🙂 Thanks for the chance! Awesome,fabulous prize,thanks for the chance! thank you so much for the chance to win!! 🙂 this would be ahhhhhhmazeballs! I would be so so happy to win something like this! Never owned any nice makeup and as a mommy I need all the confidence I can get! Honestly freaking out at the thought of having all of these palettes! Crossing my fingers and toes! Love the shades, less is always more! Thanks for the giveaway! i love Urban Decay and have wanted to try the palettes for so long. What an incredible and generous giveaway opportunity!! My daughters would LOVE this and I would also. Thank you so much. Also, where is the gfc widget to follow via gfc? I’m sure I’m just blind and overlooking it but I can’t find it. What an awesome giveaway totally entered and followed. Fabulous prize, thanks for the chance!